Having a day off work ahead of the weekend makes for all kinds of productivity. I made gravad lax, black olive truffles and a vat of soup all in the space of an afternoon. Sadly, the same couldn't be said for my other half who was glued to the sofa, playing Skyrim all day. I am definitely a PS3 widow. Midway through the afternoon, he asked me if it would be very bad if he opened the pannettone he had bought to take over to Ireland for Christmas, and I replied that it was, but I would make him a cake if he so desired. 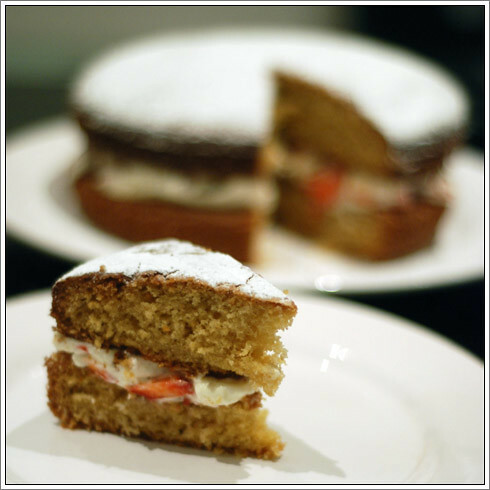 It seemed he did, so I set to work and made a very quick and easy sponge cake. This is perfect if you're in a bit of a hurry - you can have it on the table and being gobbled up within 45 minutes. Ideal for greedy gamers then! Pre-heat the oven to 170°C and line the bottoms of both cake tins with baking paper. Then sift the flour, baking powder and bicarbonate of soda into a large mixing bowl and add the sugar, eggs and vanilla essence. Melt the butter and as you beat the ingredients together, slowly pour it in. This is easier if you use a Kitchenaid! Pour the cake batter into the two cake tins and bake in the oven for 30-35 minutes, until baked and golden. To test that it is cooked, plunge a skewer into the middle of the cake and hold it there for 5 seconds. If it comes out clean, the cake is done. Set the freshly baked cakes onto a cooling rack and leave to cool. While you're waiting, mix up the filling: pour the cream, icing sugar and vanilla essence into a bowl and beat until thick and creamy. This takes about 5 minutes when beating by hand. Then chop up the strawberries and stir into the creamy filling.